There are no Windows XP drivers for the Audiotrix 3D-3G soundcard but you can still access the Yamaha XG sounds on its DB60XG daughterboard via any soundcard that has a Waveblaster daughterboard socket. I would very much like to get my most excellent Mediatrix Audiotrix 3D-3G soundcard going with Windows XP Professional. The card has been in a drawer for years, and was last run on Windows 95. Is there a possibility of locating drivers for it? PC music specialist Martin Walker replies: Sadly you won't be able to find suitable XP drivers for the Audiotrix 3D-3G soundcard, since manufacturers Mediatrix Peripherals no longer seem to have soundcards in their product range, and have been specialising in telecom technology since about 1999 (way before Windows XP came out). 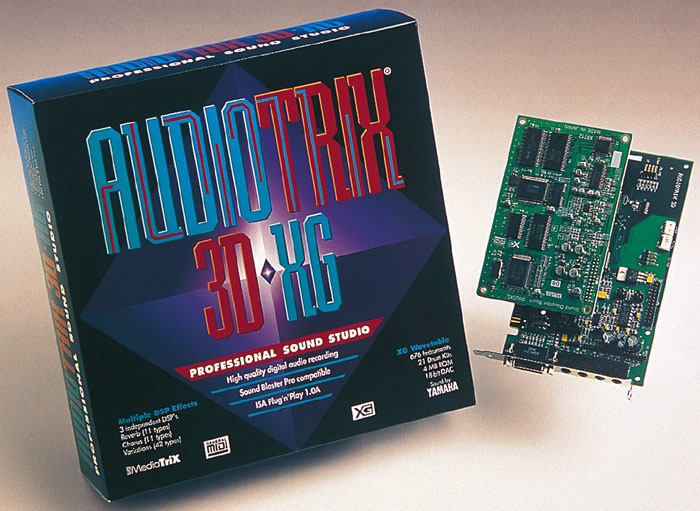 The Audiotrix 3D-3G was originally launched way back in September 1997, and when I reviewed it for SOS May 1998 I also had Windows 95 installed in my PC. However, there's also the more fundamental problem — it's a 16-bit ISA Plug & Play expansion card, which won't physically fit into the PCI expansion slots found in the vast majority of modern PC motherboards. However, before you decide to throw it away or donate it to a local museum, there may still be some light at the end of the tunnel. Because of the clever way the Audiotrix 3D-3G incorporated one of Yamaha's DB60XG daughterboards (very similar to the DB50XG, but with an added analogue input) into its design as a piggy-back circuit board, you may yet be able to unplug this and use it separately with another host soundcard that provides a Waveblaster daughterboard socket. After all, for most musicians, this Yamaha XG synth was the strongest part of the Audiotrix 3D-3G specification, with its 676 voices, 21 drum kits, 11 reverb and chorus types plus 43 other effects, 32-note polyphony, and 16-part multi-timbrality, using an identical chip to Yamaha's MU50 hardware synth. You wouldn't be alone in attempting to use the DB50XG on a modern PC (this is a regular question on the SOS Forums), since they are still extremely popular for their incredible range of quality MIDI sounds. Also, while you can't give away some soundcards, Yamaha's DB50XG is still very popular on the secondhand market, and has held its value well, with current second-hand prices ranging between £30 and £60. Many soundcards besides the Audiotrix 3D-3G have provided Waveblaster support over the years, including Creative Labs' Soundblaster 16 and AWE32 series, and the Turtle Beach Tahiti (a popular choice for its excellent audio quality), plus the MIDI Edge card, which was a handy MIDI interface with Waveblaster socket. Today, the most popular modern soundcard for musicians with Waveblaster socket and Windows XP driver support seems to be Terratec's DMX 6Fire (reviewed in SOS April 2002, and now about £130). Another budget consumer card with a good sound, XP drivers, and Waveblaster socket is the Turtle Beach Santa Cruz. It doesn't have ASIO drivers, but at only £60 is probably the cheapest way to get an XG daughterboard operational. You won't need separate drivers for the XG daughterboard since it simply uses one of the host soundcard's existing MIDI outputs. However, to get the best out of the DB50XG board you can use a software editor utility such as Gary Gregson's XGedit95 (www.yamaha.co.uk/xg/download/tools/xgedit95.zip), Michael Bray's XGPad (www.xgpad.com), or Achim Stulgie's XGgold (www.yamaha.co.uk/xg/download/tools/xggold30.exe), which also lets you get at the 'hidden' QS300 sound banks.